Easy pets are those that don't require a lot of nurturing or special care. Fish are easy beginner pets for kids. They don't require grooming, walking or even petting. Rodents, such as rats, mice, gerbils, and hamsters, good choices for easy pets for kids. They are small, furry, and cuddly. They happily stay in their cages when the kids aren't playing with them. Freshwater fish are another low maintenance option for kids. Here's what to know about each of these and other easy pets for kids. Most types of fish (freshwater) are inexpensive to buy and maintain after the initial investment of a tank or bowl and accessories. Some fish are hardier than others. For small kids, go for inexpensive, durable fish, such as goldfish. You don't want floaters to start off your child's pet career. There are 18 different goldfish types, each with different physical characteristics. The common goldfish is a great fish for beginners as it's very hardy and takes minimal care. Begin with a solitary goldfish or beta in a simple bowl. If that's a hit, you can move on to a fish aquarium. Lighted aquariums can even function as a nightlight in a child's room. Maintenance will be simply feeding the goldfish once or twice a day, and cleaning the fishbowl or aquarium once a week. And if you keep the bowl or aquarium away from direct sunlight, algae will grow more slowly and you can get by with less frequent cleanings. Ready to get started? Shop Pet Fish Supplies here. Little boys - and some little girls - love lizards and snakes. Most moms don't. Reptiles such as the bearded dragon are good, easy pet choices for kids. If your child is going to have a snake or lizard, be sure there's an adult in the house who's willing to handle it. You've got to have that back up person with pets. Put the reptile in an aquarium with a locked top. You don't want your daughter taking it out without your supervision. Avoid large snakes, such as pythons that might ingest children. Research reptiles and their living requirements. Some require live (shudder) food. If you are determined, however, at least get a snake that has been trained to accept frozen mice instead of the live, running-around variety. Then all you have to do is heat (to room temperature) and serve. 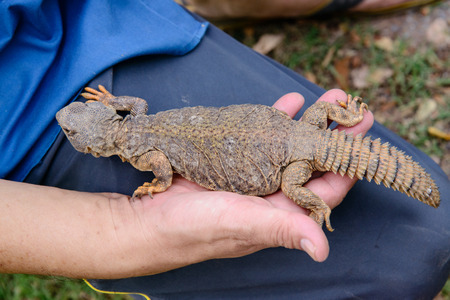 Some reptiles, like iguanas, grow to 5 feet in length and can be hazardous to other pets. Some, such as pythons, can grow to a scary 13 feet in length, and then can become hazardous to everyone. Don't forget to ask how large the reptile will be at adulthood. 'Nuff said. Even though reptiles are relatively sturdy creatures, they are still living creatures. Never let young children handle them unsupervised. Make sure you choose a reptile that is tame and does not try to bite. Good lizard choices are a bearded dragon or a gecko. Good snake choices include a corn snake, rat snake, or king snake. While reptiles and snakes are easy pets, they do have needs you'll want to consider before bringing one home: a tank, lights, water, and food. Lizards need places to hide, things to perch on. Tropical or desert reptiles will also need a heat source. This will not be cheap. Reptiles don't need a lot of exercise (though if you released one near me, I would get a lot of exercise), and they don't need a lot of attention. Figure on about 15 - 30 minutes a day to feed them, and about an hour a week to clean the tank. Shop Reptile and Snake Supplies here. Rats and mice are two different species. With two different personalities. Rats are especially intelligent and friendly, despite their nasty looking tails. Mice are cute and fun to watch in the cage, but they are a bit squirmy and nippy for holding and loving. If you want a love bucket - get a rat. Hold them at the store and if the rat or mouse is a nipper, request another one. Also, the younger you get them, the easier they are to tame and bond with. Male or female? Good question. Male rat urine can be a bit smelly, plus males will mark territory with a drop of urine - a drawback if you let him out a lot. On the other hand, males are a lot calmer and more loving. If you change the litter at least once a week, smell should not be an issue. You'll need a special place for a rat cage because the shavings or litter can be messy. And the cages take up a lot of room: Each rat needs a minimum of two cubic feet of living space. So if you have a rat couple, that means you'll need a cage 2 feet by 2 feet by 2 feet. Rats also need to be let out to run around at least a few minutes each day. You or your child will need to supervise this outing, as they like to nibble through electrical cords and other wires. And of course you don't want them getting lost in your closets or walls, either. Rats live 2 to 4 years; mice 1 to 3. Get Rodent Pet Supplies here. Hamsters: These guys need extra Vitamin C. They can bite, and they're more vocal than most rodents. They are best kept alone. They are nocturnal, and may be a bit sleepy during the day, and more active than you would like at night. They live 2 or 3 years. Gerbils: These are small but fun pets. Not as intelligent or cuddly as rats. They are happier in pairs, so get a couple. They live 2 to 3 years. Guinea pigs: These chubby little rodents make sweet, gentle easy pets. Get a pair. They need a large cage and a special diet of hay, vegetables and Vitamin C. They can live 5 to 7 years. Birds are usually not good pets for kids under the age of 8. Younger children generally aren't gentle enough with them to properly care for them. Young kids dart around and alarm birds. Small birds, however, make excellent easy pets for kids aged 8 and older. If you buy a bird that has been hand-raised, it should bond readily with its new owner and be quite tame as long as you handle it regularly and gently. Small birds are easy pets because they are generally confined to the cage and cannot wreak too much havoc. You only need to change the papers in the cage each day and replenish its food and water. You'll need to do a more thorough cleaning about once a week. Cockatiels and parakeets are particularly good choices. The smaller birds, such as finches and canaries, are mainly for watching, not petting. Cats and kittens are sweet and cuddly, making them a good choice when it comes to easy pets for kids. They're definitely low maintenance - you can go away for a weekend and just leave out food and water out for them. 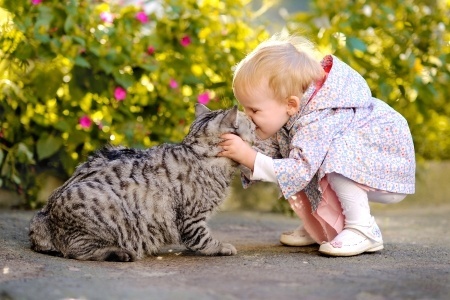 Cats are sweet and cuddly, one reason they're a favorite pet for kids. They're not messy - in fact, they're fastidious - and will look at you in dismay if you neglect to regularly clean their litter boxes. Of course, they have their drawbacks. They shed. A lot of people are allergic to them. And if you don't provide them with alternate places to scratch, such as a cardboard or carpeted scratching post, they can literally shred furniture and floor coverings in a matter of days. They are relatively long lived (15 - 20 years) and if you keep them indoors, they are usually healthy animals. Don't get kittens for small children: Cats between 1 and 3 have all the playful kitten attributes, but are a bit hardier and can easily get away from rough little hands. Before you ever give the nod to a pet, have a serious talk with your child. Discuss the costs and responsibilities the pet entails. Discuss who's going to do what and when (see Pet Chores for Kids by Age). Discuss consequences for neglecting a pet, and follow through with them. Get the E-Book on all this pets and kids!